Garrett Lear, a native New Englander born in 1948, is affectionately known across the nation as “The Patriot Pastor” because of his expertise and extensive knowledge and documentation of the founding of America , his deep abiding love for the original intent of The Founding Fathers and his understanding of The New Testament Church. 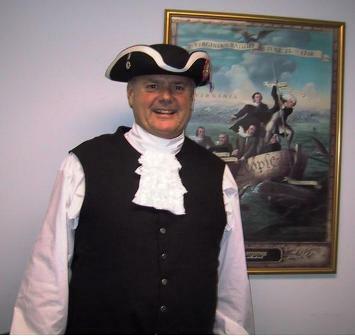 Pastor Lear has 391 years of ancestry in New England America and is a member of The National Society Sons of The American Revolution. He is also a member of several historical societies. His ministry has an extensive archive of American Christian history. Garrett has received many patriot awards. He has been in ministry since 1974 with the last 30 years full-time with ministry in all 50 states, Canada and Eastern Europe. Although, he has an imposing stature at 6’7”, it is very obvious that he loves Jesus Christ with all his heart, mind and strength while he teaches others to do the same. He is commonly referred to as a great encourager of victorious Christian living in any circumstances. Garrett has been a denominational leader, a local pastor, evangelist, prison chaplain, prayer intercessor, local leader of many national ministries, Bible college teacher, Gospel singer ,worship leader, revival and conference speaker. He is mentor and often called upon wise counselor to many church, government and business leaders across the country. He has been appreciated especially in men’s ministries over the years… a man’s man. He is a popular radio, television and media guest including such national programs as The 700 Club. He has hosted his own radio broadcast “Water From The Well” and owns 3 Internet websites that are widely visited. It is said of him that he is always interesting, well informed, often humorous, understandable, vigorous and filled with The Holy Spirit… and that he expects great things to happen in The Lord’s presence… and they do. His practical application of Biblical principles are seasoned with many years of living by faith and the testimonies of The Lord’s miraculous answers to prayer. Garrett and Annette, his wife of 30 years, who is a Hawaiian , founded The Well of Living Water Christian Ministries based on John 4 in 1980 in Hana, Maui, Hawaii after a lengthy time of fasting and prayer. They have 4 natural children, numerous foster children, 1 grandchild and many spiritual sons and daughters in The Lord. They home educated their children and encouraged others to do the same. Pastor Lear has often spoken at the NH legislature supporting legislation favorable to home schoolers and Christian schools. He has openly challenged Christians all over America to withdraw their children from the government schools. He has been one of the most active prolife, pro family, pro traditional marriage, original intent smaller government clergyman in New Hampshire and America. They make their home and ministry base office in the mountains of New Hampshire where Garrett enjoys many outdoor activities and supports local organic farming for healthy living. He was recently awarded the President’s commendation from The Hampton Rod & Gun Club for years of hard work & service.